New downloadable offer from Top Tax Defenders simplifies and explains the complicated subject of IRS audit correspondence. When taxpayers have an understanding of IRS audit letters, they'll find they can often resolve their tax problems with less effort than they thought. Top Tax Defenders has released a new eBook for taxpayers called "Don’t Panic: Your Complete Guide to Understanding IRS Audit Letters." This guide, which is available on the company website, is designed to provide assistance to taxpayers who receive IRS audit letters and notices during the year. Since most IRS audit letters go out after the tax deadline ends, taxpayers may find that this e-book is especially helpful in the coming months. "Don't Panic: Your Complete Guide to Understanding IRS Audit Letters" covers all of the common IRS audit notices that the agency issues each year. It begins by explaining the difference between an IRS letter and an IRS notice, as well as what situations are covered by each type of correspondence. Along with detailed explanations of each notice, it explains the IRS audit process and what taxpayers can expect when they receive an audit letter. Taxpayers will also find suggestions for how they should respond to IRS audit letters, how they can reduce their audit risk, and how they can protect their assets and lower their tax liability after an audit. The guide provides information about what taxpayers should do if they are unable to pay their tax balances to the IRS. According to Jayson Mullin, CEO of Top Tax Defenders, the company's focus is providing aggressive yet ethical help for taxpayers through hard work, perseverance, and experience. Mullin went on to say, "When taxpayers have an understanding of IRS audit letters, they'll find they can often resolve their tax problems with less effort than they thought. With this e-book, we hope to take some of the fear out of the process of receiving an IRS audit notice." 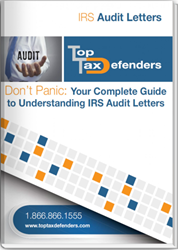 In keeping with that sentiment, Top Tax Defenders has made the e-book "Don't Panic: Your Complete Guide to Understanding IRS Audit Letters" available for download on the company website. Top Tax Defenders is a Houston-based firm that specializes in resolving tax problems. They can be contacted by calling 1-866-866-1555 or by visiting their website.